Eastbourne's first workhouse stood on what is now Grove Road. In 1777, it could house fifty inmates. In 1817, it moved to Church Street, into premises built as a barracks during the Napoleonic Wars. Its inmates in 1832 comprised fourteen men, fourteen women, eighteen girls and seventeen boys. In 1777, parish workhouses also in operation at West Dean (housing up to 18 inmates) and Wilmington (8). An Eastbourne Gilbert Union was formed in about 1794. 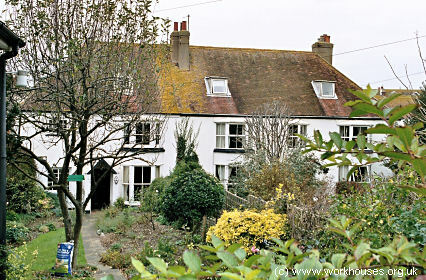 In 1817, the Eastbourne Guardians established a workhouse on Church Street in rented premises that had been built as a barracks during the Napoleonic war. Seaford's parish workhouse was located on Blatchington Road on the site of the medieaval leper hospital of St John's. The master and his assistant resided in Twyne House and Twyne Cottage, while the inmates lived in a long building in the yard behind, now occupied by St James' Trust. Twyne Cottage (left) and Twyne House, 2004. 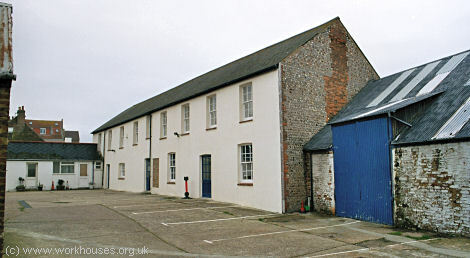 Seaford former parish workhouse, 2004. County of Sussex: Alfriston, Eastbourne (3), East Dean, West Dean, Folkington, Friston, Jevington, Littlington [Litlington], Lullington, Pevensey, Seaford (2), Westham, Willingdon, Wilmington. Later Additions: Alciston (from 1898), Berwick (from 1898), Hampden Park (1911-12), Norway (1894-99), Selmeston (from 1898). The population falling within the Union at the 1831 census had been 7,823 — with parishes ranging in size from Lullington (population 49) to Eastbourne itself (2,726). The average annual poor-rate expenditure for the period 1831-34 had been £11,964 or £1.10s.7d. per head of the population. The workhouse later became St Mary's Hospital. The buildings were demolished in 1990 and the site now contains a housing development. By the early 1900s, the Eastbourne Union had established a children's home at 2-4 Birling Street, Eastbourne. In 1908, the home could accommodate 20 children, with Miss E. Field as Foster Mother. The property is now in private residential use. West Sussex Record Office, County Hall, Chichester, West Sussex PO19 1RN. Holdings include Guardians' minutes (1835-1930); Births register (1908-19); Deaths register (1908-30); Emigrations (1899-1930) etc. Eastbourne Library, Grove Road, Eastbourne BN21 4TL. Holdings comprise: Abstract of accounts (1884-1919 - these list residents); Minutes of meetings (1923-29). Surtees, J (1992) Barracks, Workhouse and Hospital: the Story of St Mary's Hospital, Eastbourne (1794-1900).